Choose from all-you-can eat dining halls, fast food chains like Chick-Fil-A, Subway, Port City Java and Dunkin Donuts or grab something quick at our convenience stores located throughout campus. The best part is that no matter where you are on campus, you're only steps away from one of our dining locations. Click the button below for daily menus, maps, nutrition information and more. 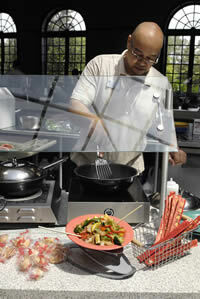 The community surrounding campus has an almost unlimited variety of dining options. Click the button below to explore the Cape Fear Visitor's Guide local restaurant list.